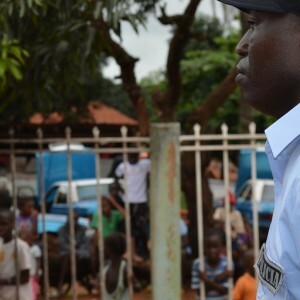 The Institute for Security Studies (ISS) and the UN Integrated Peacebuilding Office in Guinea-Bissau (UNIOGBIS) are providing national, regional and international actors with the tools to tackle Guinea-Bissau’s enduring institutional and security challenges. Their analysis and policy advice support efforts by the Economic Community of West African States (ECOWAS) to mediate the crisis that started in 2015. ‘The work of the ISS is an important step in consolidating the rule of law and democracy in Guinea-Bissau’, said Agnelo Augosto Regalla, Guinea-Bissau’s Minister of the Presidency of the Council of Ministers and Parliamentary Affairs, in his opening speech at the meeting to discuss the ISS proposals. Guinea-Bissau has for decades been characterised by political tension, coups and regular changes of government. Optimism after the 2014 elections was followed by a new political crisis, leading to the 2016 Conakry Agreement brokered by ECOWAS. Implementation of the agreement has been slow and breaking the cycle of crises requires institutional changes. As a result, experts from ISS Dakar, with the support of UNIOGBIS, carried out in-depth research on the multidimensional reforms envisaged in the Conakry agreement. The country has recently seen positive developments with the appointment of a consensual Prime Minister, the formation of an inclusive government and the reopening of the National Assembly. Attention is now focused on the November 2018 elections – widely seen as a solution to the crisis. But the difficult task of reforming institutions that are key to Guinea-Bissau’s political stability and lasting peace remains a challenge. A series of recommendations published by the ISS and UNIOGBIS were discussed by government and civil society stakeholders in Guinea-Bissau in May. The meeting provided a useful opportunity for researchers, academics, government officials and international organisations to debate policy options. The ISS analysis provided a solid starting point to weigh up various reforms, the obstacles to their implementation, and how to find practical solutions. ‘The analyses prepared by the ISS are of paramount importance to understand the challenges facing the stabilisation of Guinea-Bissau and how to overcome them,’ said Guinea-Bissau’s Minister of Justice Mamadu Iaia Djalo. The donor community and the African Union (AU) also have stake in Guinea-Bissau’s future. In June, the ISS briefed members of the diplomatic community in Dakar about recent political developments in Guinea-Bissau and possible reform options. ‘I have read with interest the ISS notes on the institutional reforms in Guinea Bissau. They are a useful tool to support our effort to promote a lasting peace in this country,’ said Ambassador Fred Ngoga, Head of the AU’s Conflict Prevention and Early Warning Division.